May 9, 2009 Adri H.
Using the lovely photo tutorial on Threads Magazine, the husband and I ventured into the dress-form making process. I was working on the garbage wedding dress and got to a point where I couldn't go any further because I couldn't pin the dress on myself and fit it effectively. So... this is my solution. Now you can see the nearly finished dress-form (sleeves need to be tailored and the whole thing covered in muslin). Below you can see me cutting the pieces of packing material for the dress, and later the Papier-Mâché strip dress form drying on me. 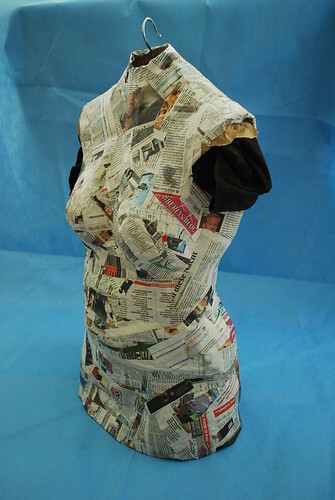 Update: This dress-form, although fun to make, was only a temporary solution. It lasted only a few weeks. The form collapsed into itself when I tried pulling a garment over the top of it. If I made it again, I would stuff it with hardier materials.